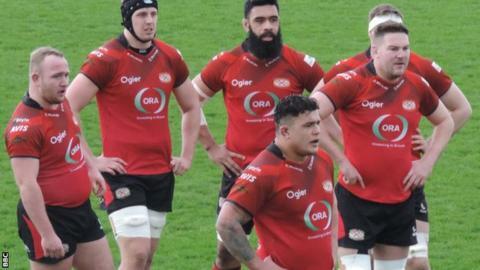 Jersey got back to winning ways with a hard-fought win over relegation-threatened Moseley. Nick Haining's early converted try put the islanders ahead but Moseley were in front at half time thanks to Charlie Foley's try and his two penalties. Forwards James Freeman and Uili Kolo'ofa'i crashed over to put the hosts in control. But Moseley full-back Kyle Evans scored in the corner to set up a tense finale. Jersey climb back into the top half of the table while Moseley are a single point behind Ealing at the foot of the Championship. Jersey lost their first four matches against Moseley and drew the fifth, but have now won the last three meetings between the sides. The islanders were ahead after five minutes when back-row Haining scored beneath the posts, but Moseley hit back when fly-half Foley darted through to touch down in the corner. In windy conditions at St Peter he was unable to convert from out wide, but two successful penalties gave the Midlanders an 11-10 advantage at the break. Haining's powerful run after the restart was halted just short of the line but flanker Freeman was on hand to put the hosts ahead again. With Moseley lock Greg Charlton in the sin bin, Tonga international Kolo'ofa'i capitalised on a driving maul for a converted try that opened up a 22-11 lead for Jersey. But with Moseley battling for their Championship survival Evans was found in space out wide and scored, putting the result back in doubt. Come the end of the season every point could be crucial for Moseley, so when the clock ticked past 80 minutes and they won possession back near their own line they opted to kick the ball out and collect the losing bonus-point instead of risking a length of the field move in a bid to find a winning try. Jersey: Adair; Howe, Evans, Cooke, Lane; Penberthy, Fisilau; Lockwood, Selway, Herriott, Kolo'ofa'i, Phillips, Rae (capt), Freeman, Haining. Replacements: Lancuba, Garcia-Veiga, Kerrod, Markham, Spinks, Moates, Owen. Moseley: Evans; Cheshire, King, Molenaar, Watkins; Foley; Brown, Fidler, Caves, Gardiner, Charlton, Flagg, Lawrence, Siggery, Brightwell. Replacements: Warren, Tolmie, Voisey, Raven, Hone, Brazier, Hudson. Is Hartley the right captain for England? Read more on Six Nations 2016: Is Dylan Hartley the right captain for England?